Who doesn't like free cards? As in "Thanks for stopping by. Here, have some cards!" free. 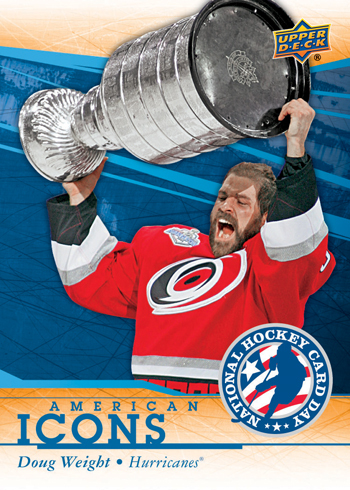 2014 Upper Deck National Hockey Card Day returns on Saturday, January 18 in both Canada and the United States. All collectors need to do is go to a participating shop and they're receive a pack of exclusive cards. 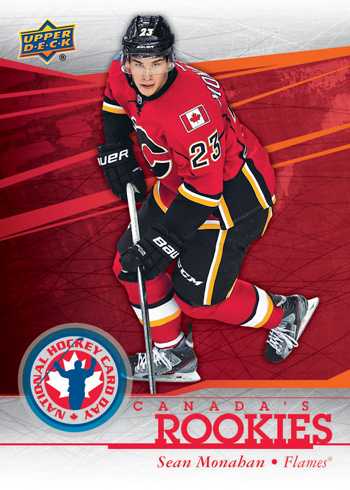 Like last year, 2014 Upper Deck National Hockey Card Day sets are completely different on both sides of the border. Each has an expanded checklist of 21 cards, but they're all different. 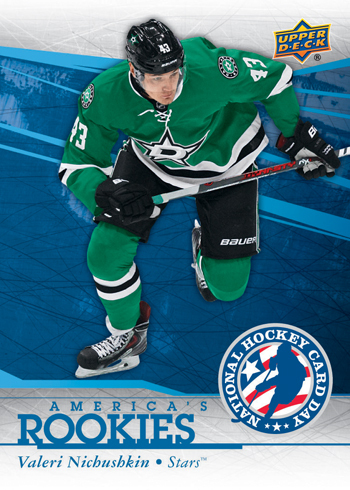 Capitalizing on the double-rookie class, they are a big focus for both the Canadian and American sets. Rookies make up half of the pack-inserted cards. 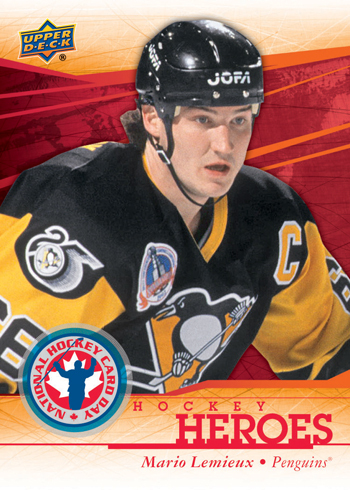 Other Canadian subsets include Pride of Canada and Hockey Heroes. 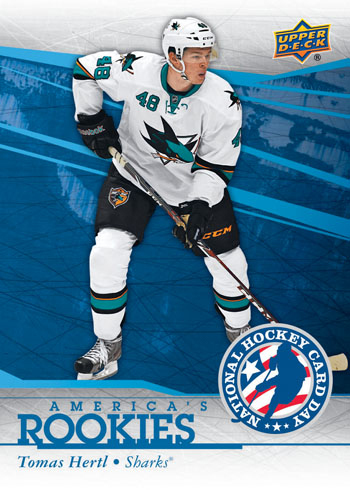 American packs also have Stars in Stripes and American Icons cards. Card #21 for both sets can't be found in packs. They're available as a gift for those who spend $10 at participating shops. Each of these Memorable Moments cards has two rookies on them. 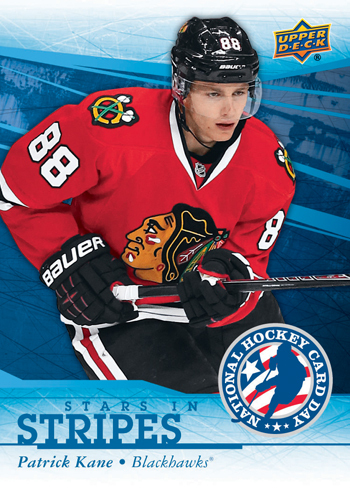 2014 Upper Deck National Hockey Card Day packs come with five cards. Collectors can also hunt for randomly inserted autographs. Canadian London Drugs and Toys 'R Us as well as other select partners have special eight-card sheets. This marks the sixth year for the program in Canada and the third in the United States. 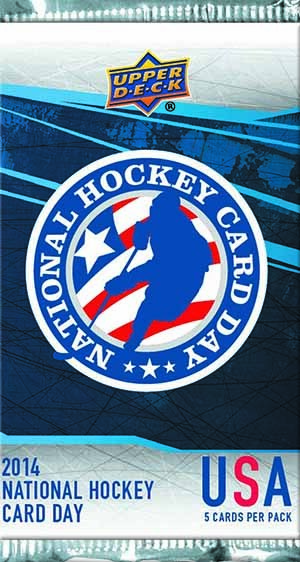 The National Hockey Card Day website has a full list of participating stores. 21 cards. Card #21 available free with $10 purchase. I’ve been collecting them since the beginning. The family are in with me. 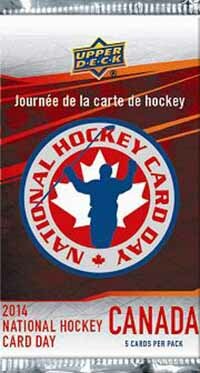 That day, all of us go out in Montreal and collect until I have the set. It a very good day to spend in togetday all 3 of us. Me + My lovely wife and my Son of 22 without forching him. We spend all day together, launghing + dinner + the ride in the buses. Never forget. Interesting how the giveaway is 24 hours out and yet there are several dozen already on eBay. Are these sellers unscrupulous dealers who don’t disburse the packs as they were intended to be? Might be too much to ask, but maybe Upper Deck could serialize the run and monitor its dealer distribution – if the cards hit the secondary market aheat of schedule UD could rescind any future promotions with said offenders. Sandy � That’s horrible to hear. You could always let UD know. Stuff like that wrecks it for everyone and defeats the purpose of these types of programs. Are these cards cut oddly. I noticed some of the cards a lot shorter than others. Is this a product wide issue? Canada & USA. Thank you. 2013-14 Upper Deck Hockey Series 1 HOBBY Box Young Gun Auto Rookie Patch Jersey?